The crew were excited about the Brain Slugs. Matt and David wanted the brain slugs to increase brain power. The joke about the cinemas name is the geekiest joke ever but only the 15th geekiest joke on the show. One of the crew sat and watched all the James Bond openings to create the opening to All My Circuits: The Movie. David couldn't see the movie GO as he need to enter the first three letters of the movie but there's only two letters. Sometimes the cast enter words into the script. David Herman has to change voices for the high number of characters he plays. There are about 30 to 40 different songs per episode. Bender seems to heal even though he's a robot. 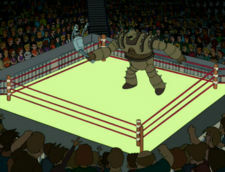 The Ultimate Robot Fighting commissioner re-appears in "A Leela of Her Own". A Gender Bender toy was made. Unpopular toys are actually the most popular? Madison Cube Garden is used for so many things. Instead of having a normal person impersonate a sports commentator they got Rich Little to do it. Every TV show or movie has used the slow motion punch. Lewis Morton: It originally aired on 37 February. David X. Cohen: 37? There isn't a 37th of February. David X. Cohen: And there's our most understated actors David Herman as Master Fnog. Billy West: We've been looking for a way to do that for years. Matt Groening: Yes fox does have a censor. This page was last edited on 9 September 2013, at 22:30.